Last year I released my top twelve new bars and restaurants to hit Baton Rouge in 2012. This year I'm at it again, although I don't want to keep climbing, so I'm actually narrowing down the competition to the top ten. I recruited the help of some wise people to come up with the list, but in the end I'll take full responsibility for it. I'm sure there might be some omissions, so if your favorite new bar or restaurant didn't make the cut, feel free to tell me about it in the comments. Before you do that though, make sure it opened its doors in 2013 and make sure it isn't a national chain. I obviously didn't include those! 10) The Big Squeezy - This place is so new that it almost didn't make the list... but I also didn't want to leave it off and then not have it be qualified for next year, so here it is. The Perkins Road Overpass area got a trendy new juice bar at the tail end of 2013, and so far the perception is very good. The colorful assortment of raw, cold pressed juices have been a hit. 9) Galatoire's Bistro - No, Galatoire's is not original to Baton Rouge. Heck, the new spot isn't even the first Galatoire's in Baton Rouge. But it is new. And it certainly is not a national chain, so it counts. In the brand new shopping center at Acadian and Perkins a beautiful fine dining restaurant beckons with temptations of old New Orleans. No, looking out onto Perkins or the Trader Joe's parking lot will never be like Tennessee Williams looking out onto Bourbon, but it still gets its respects. 8) Red Star - Another one that could be argued isn't new, I again disagree. Red Star was shut down, sold to new owners, and reopened in 2013. With new ownership and a bar that did indeed open this year, I think it belongs on the list. Red Star is a unique bar in downtown that comes with different patrons than most of the other bars. That's important when you want to have a thriving nightlife. Not all the bars can be the same, or you only end up with the same type of people. Look at Tigerland. Downtown needs to embrace as many different types of people as possible to create a true metropolitan culture that supports as many diverse professions and lifestyles as possible. So I'm glad Red Star is back, and I'm happy to include them on this list. 7) Leroy's - This campus area eatery was opened by Stephen Hightower in a space that previously failed as Cou-yon's BBQ and Purple Goose Pub & Grub. You'd expect that the Nicholson Dr. restaurant would thrive on college kids but it turns out it has actually developed a very family friend clientele with its southern rooted menu, fried chicken, and more. And for the adults, you can also get a beer shake. Yes, an ice cream shake with beer. Nice! 6) Omi - Joe Deng, the chef and owner, returned to the Baton Rouge culinary scene after selling his LSU area restaurant, Koi Japanese Cuisine two years ago. Omi is one One Calais Place off of Essen in a building that has been numerous restaurant before, but hopefully this one can stick around. You won't find any buffet style sesame chicken here. Omi serves up an authentic Northern Chinese menu as well as a Japanese menu with sushi and other specialties. According to Cherry the Dive Bar Girl, "I have not had Chinese this good since I lived in Chinatown Brooklyn." 5) Zorba's Greek Bistro - Another restaurant that has been in Baton Rouge before actually dates back to 1984. The Economides family re-opened Zorba's in May and may have reclaimed the crown for the best Greek food in Baton Rouge. The menu items are fresh and inspired and features much more than just hummus and a gyro sandwich. James Fox-Smith nominated Zorba's for "giving us Baton Rouge's only real Greek/Cypriot menu." He added, "Their lamb is just spectacular." 4) Streetbreads - This one is new to Baton Rouge but not the first ever location, so I guess it falls into the Galatoire's category... which is pretty funny to think about since it is about the opposite of Galatoire's. We're back on Perkins Road, right down the street from Galatoire's, for Streetbreads, the Lake Charles import sandwich shop that is re-imagining the way quick and tasty sandwiches get to your belly. 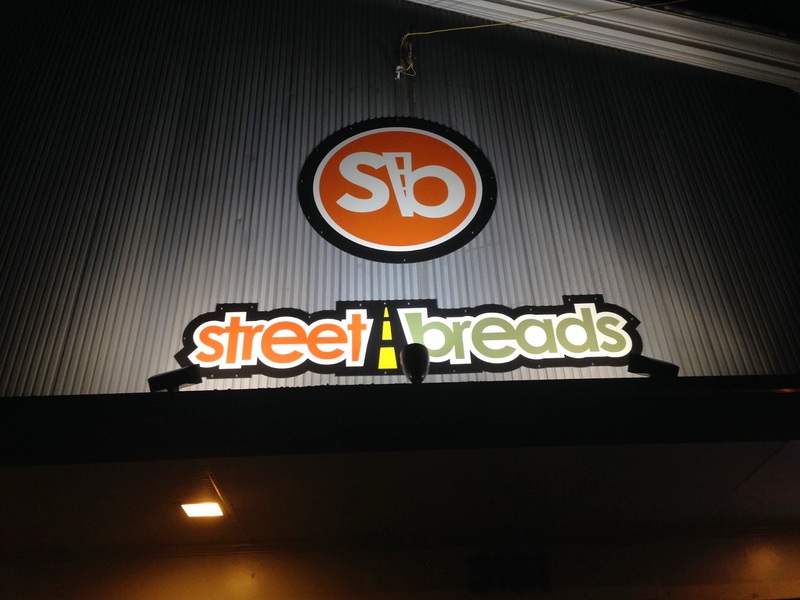 Seriously folks, next time you're in the market for a sandwich like Subway or Quizno's or some other national chain, head to Streetbreads instead. You'll get a tastier, fresher, local-er sandwich... and you can get some of their feta potato salad! Oh, and they also have beer and wine! Brilliant! 3) Stab's Steak and Seafood - Allow me to get on a soapbox for a second. Obviously all the City of St. George business recently has created even more division to the Baton Rouge area. It is really a shame. I strongly stand by the idea that we are better together. That being said, there has always, as long as I've been around (1981), been a division between Baton Rouge and its surrounding towns. Livingston Parish is a curse word. Those damn people from Denham Springs. Baker, Central, Zachary... all worthless. Port Allen and Plaquemine might as well not exist. Ascension Parish? You should have just kept going to New Orleans instead of stopping in Prairieville or Gonzales. I've never understood why there is such animosity. I certainly like living in the city, and I wish people wouldn't escape to the suburbs just for the school systems, but that's a problem in any decent sized city in America. But other cities can respect their neighbors a whole lot better than most people from Baton Rouge. I'll admit that I don't get those towns and surrounding parishes enough. There are plenty of places that I need to eat surrounding Baton Rouge. But at least I'm willing to go if they are local. All of the towns I mentioned and plenty that I didn't are part of the greater Baton Rouge area, and I think we'd all be better together instead of trash talking about each other. So, with that being said, you really ought to try Stab's Steak and Seafood in Central. The latest creation from Wayne Stabiler who previously brought us Little Village and Le Creole, Stab's has brought an upscale element to one of those previously mentioned BR suburbs. And for those living in the city, it is worth the drive. 2) City Pork - Another brand new addition to the Baton Rouge culinary scene and yet another joint just off of Perkins Road near the overpass, City Pork has hit the ground running and sent the pigs squealing. Charcuterie, sandwiches, craft beer and soda... this place has been a long time coming. Cherry adds, "I can't love City Pork enough... I can't wait to have a Charcuterie platter at happy hour. The sandwiches are suburb and the service is fast and friendly. Baton Rouge needed a home-grown deli inspired by the flavors of both South Louisiana and Europe." I agree that we needed it, and I also agree that City Pork has delivered. The first time I went in with very modest expectations. I had been told they were like Cochon Butcher in New Orleans. Being a huge fan of Butcher, I became scared that City Pork would be over-hyped for me. I was nervous that they would have tried to imitate Butcher and as would be expected, failed. But instead what I found was a unique, inspired, and very well executed neighborhood joint that created its own style. There are plenty of similarities for sure, but I also appreciate the fact that City Pork did it their way. It isn't an attempt at imitation but instead a void-filling attraction that has come into a market the right way and should be around for a long time. This is kind of place that will have lines out the door at lunch time. This is the kind of place that did their research, spent their money, and opened up something that is proper, cultural, and brilliant. Thanks to the guys at City Pork, and welcome to the city. 1) Pelican House - Finally, we get to Pelican House. With 136 beer taps and a great whiskey selection, it is hard to argue about Pelican House topping this list for 2013. The guys behind the bar have put in a tremendous amount of passion, enthusiasm, and elbow grease into getting Pelican House launched. They turned an old Macaroni Grill along I-10 into a local establishment that is unrecognizable as the shell of a former corporate chain. The interior is sleek, clean, and spacious. If anything they've struggled with being too big, but they've worked out the growing pains as the months have gone on. It came in third in my list of the best places to drink craft beer in Baton Rouge back in September. I'd say that isn't bad for only being months old at the time. Pelican House is a great addition to the craft beer scene. The food has found its groove as well. The patio will be perfect for the Spring, and in February they will begin offering great bar trivia through geekswhodrink.com. This will be a giant watering hole for years to come and I'll gladly support the cause with pints along the way.